Yemen In 'Clear And Present Danger' Of Massive Famine After Years Of Violence The looming catastrophe is "much bigger than anything any professional in this field has seen during their working lives," says the United Nations' humanitarian chief. 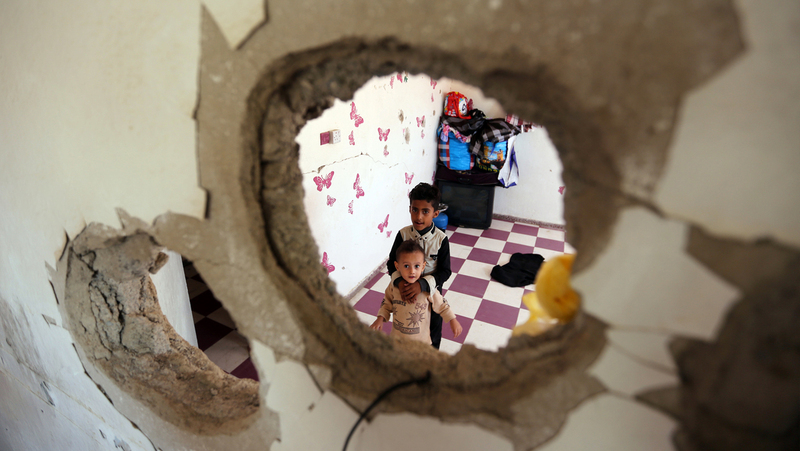 Displaced Yemeni children stare through a hole in the wall of a half-destroyed house in Taez, where they have been staying with several families since violence drove them from their homes in Hodeidah earlier this year. The United Nations' humanitarian chief warned a month ago that war-torn Yemen was on the brink of a "massive loss of life" — a famine-fueled catastrophe that may spell the complete collapse of an already failing country. Since then, he says the dire situation has only gotten worse. "The toll is unbearably high," Mark Lowcock told the U.N. Security Council on Tuesday. "The immune systems of millions of people on survival support for years on end are now are literally collapsing, making them — especially children and the elderly — more likely to succumb to malnutrition, cholera and other diseases." Last month, the U.N. Office for the Coordination of Humanitarian Affairs said 8 million people were desperately dependent on aid and some 3.5 million more risked joining them. But Lowcock said Tuesday that even as stark as those numbers were, they did not do justice to the crisis in Yemen. A Yemeni woman and her child sit outside a school set up for displaced persons in the capital, Sanaa. The pair fled the port city of Hodeidah after Saudi-backed forces launched a large-scale offensive there, years into Yemen's devastating civil war. "In the absence of a cessation of hostilities, especially around Hodeidah, where fighting for more than four months now has damaged the key facilities and infrastructure on which the aid operation relies, the relief effort will ultimately be simply overwhelmed," Lowcock said. "The time, surely, has come for all the parties to heed these warnings." None of the parties in Yemen's complex war has heeded those warnings yet. The Houthis, a Shiite rebel militia, seized the country's capital and northwestern regions from its internationally recognized government in 2014. The next year, a coalition of Arab states led by Saudi Arabia launched an airstrike campaign against the Houthis, which for their part are backed by the Saudis' regional rival, Iran. In the years that followed, a complex web of combatants — with an even more tangled skein of interests — have carried on the war in Yemen with few hopes of resolution. In fact, one of the few firm answers to emerge from the violence is its effect on the country's civilians: More than 17,000 killed or wounded in the fighting. More than 1 million suspected cases of cholera last year alone. At least 3 million internally displaced by violence. Toward the end of last year, the charity group Save the Children estimated that about 130 children were dying of hunger or disease every day in Yemen. The conflict has prompted an outcry not just from humanitarian groups, but from international organizations — which have accused all sides of possible war crimes — and politicians in the U.S., as well. The U.S. has supported Saudi Arabia's military campaign in the country — support that has come under renewed scrutiny in recent weeks, compounded by the killing of journalist Jamal Khashoggi at the Saudi consulate in Istanbul. Lowcock, the U.N.'s humanitarian chief, did not single out any one country for criticism. Instead, he directed his urgent pleas to "all stakeholders to do everything possible to avert catastrophe." That includes not only an end to the violence, but also increased funding for humanitarian efforts and better protection of the food supply. A failure to follow those steps, Lowcock said, would be "the death knell for countless innocent civilians, most of them women and children." "There is now a clear and present danger of an imminent and great big famine engulfing Yemen," he added. "Much bigger than anything any professional in this field has seen during their working lives."